There are NO pattern pieces needed for making these...so don't be searching for 'em when you print off the instructions!! This video is like 2 friends just sitting at the table crafting together! 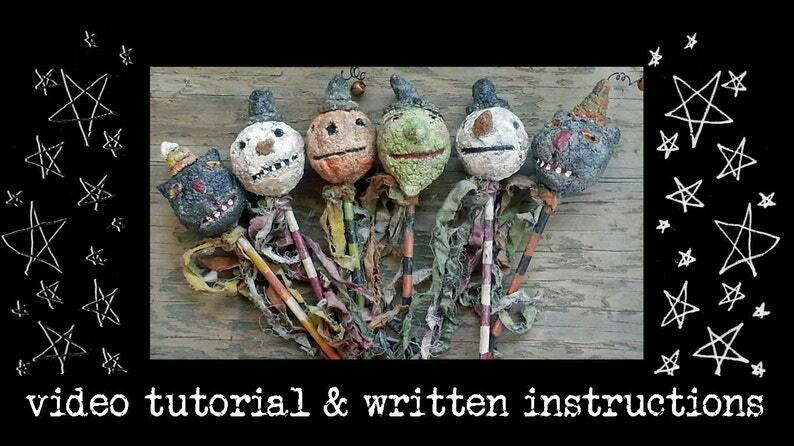 The doorbell rings, the dog barks, the weed eater in the background, me sneezing, the phone constantly going off...but in spite of all that...you WILL learn how to make these fun "Paper Mache Rattle Wands"!! YES!!! They all actually RATTLE when you shake 'em!!! Is it the most professional online video tutorial you've ever purchased...NO...but, I'll promise ya it's the most laid back and you get me... just being me!!! And if that wasn't enough for ONLY $2.00 you will receive a 2nd video on how I make my aging stain~mixture~liquid. And YES!!! You can make these "Rattle Wands" for profit... as many as YOU can personally make! They are just so fun to use in so many different ways, tied to a package, stuck in a plant, attached to a wreath...you can even wear 'em!!!! I am in the middle of making a batch of these, i can't wait to see the end result. You have great stuff!! Love it! Love this tutorial! Love your style and I will have fun making these!